Fused deposition modeling, or FDM, is an innovative type of printing that uses additive manufacturing technology to produce 3D objects. Common applications include prototyping, small-batch manufacturing and hobbyist use. The term "fused deposition modeling" and its FDM abbreviation are terms trademarked by the developer of the process. Therefore, the term fused filament fabrication, or FFF, is also used as an exact synonym for this type of printing. Both abbreviations and terms are used here. Some also call the process fused filament printing. Several types of 3D printing have been developed or are in development, but FDM printing remains the most common and cost-effective. Let's break down the process of FDM/FFF additive manufacturing. Additive manufacturing: This term, or the abbreviation AM, simply means that molten material, the additive, is extruded from the printer in layers, so that a 3D object is being built up one layer at a time. Layer thickness is a consideration in the density and strength of the finished item. Materials are stored on a spool while a servo or stepper motor feeds the material at a controlled rate to the printer head outfitted with a nozzle. 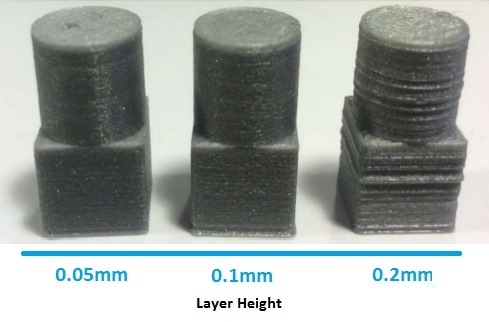 Many 3D printers support several nozzle sizes to create layers appropriately thick for the design. Molten material: In order for the material to be extruded, it must be melted, so 3D printers employ a heat source. Depending on the material, the nozzle might be heated with the use of electric resistance coils for the purpose of melting the material. 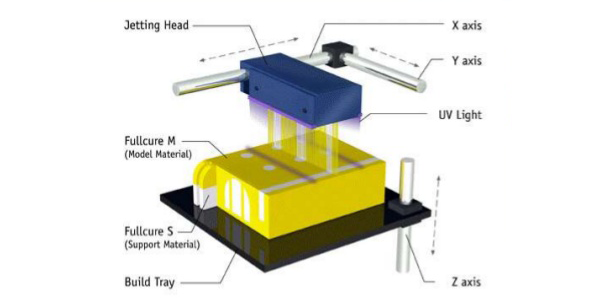 This process is used, for example, to heat thermoplastics beyond their glass transition temperature point, so that the material can be fluidly deposited in layers to form the object. The heat of the coils can be adjusted based on the requirements of the material being used in the FDM printing project. The non-molten material being fed to the head acts as the plunger to push molten material through the nozzle to create what is called the "road". Fused layers: The heating of the material also allows for the layer of fresh, molten material to fuse properly to the existing layers to create a strong and durable bond. Multi-directional printer extruder head and nozzle: Fused deposition modeling 3D printers feature nozzles that move both horizontally and vertically to create the necessary shape. Computer aided manufacturing (CAM) software is used for the purpose of controlling the direction of the extruder head and nozzle during the 3D printing process. 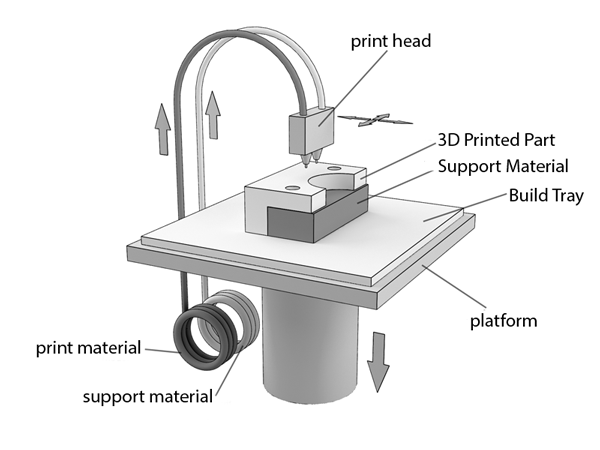 The nozzle head is then raised or the platform on which the printed object is taking shape is lowered to create depth. Additive deposits are printed in an x-y-z rectilinear, three-dimensional design with x as vertical and y as horizontal. As 2D layers are added on top of each other, the z axis providing depth to create 3D takes shape. During the process, bracing or scaffolding might be required for support of the object being manufactured based on its design. This additional material is typically printed as part of the entire FFF print process and then removed mechanically when printing is completed. A wide range of materials can be used in fused filament fabrication 3D printing. ABS: Most entry-level and home 3D printers use ABS plastic to create a wide range of items from tools to toys. The filament form of ABS is employed for FDM printing. The pros of ABS include the many colors it is available in and its excellent strength. It is an affordable material as well, as it is produced in many non-proprietary forms. PLA: This is a biodegradable plastic that is becoming more popular as an ecofriendly alternative to traditional plastics. The downside is that it is not as durable or flexible as ABS plastic. PLA filament is used in FDM/FFF printing while PLA resin is used in other types of 3D printing. Transparent and colored PLA is available. Nylon, aka Polyamide: Nylon filament is a popular choice in FFF printing due to its many advantages. It is flexible, strong and durable. Nylon is easily colored prior to or after printing, but is used in its natural white too, so is often referred to as white plastic. Interlocking and moveable parts can be fabricated with nylon. PET flexible plastic: Polyethylene terephthalate (PET) is used commercially in many applications including plastic bottles and carpet fibers. PET is hard, light and flexible, so it is a good choice for lightweight objects that don't need to be very strong. Polycarbonate (PC) – strong, resistant to heat and impact. It has high tensile strength and is used in the automotive and aerospace industries. TPE (NinjaFlex) – thermoplastic elastomer (TEP) is a top choice when elasticity is vital to the design, and it offers smooth feeding and good build platform adhesion. PETT or T-glase (tough glass) – offers biocompatibility and is FDA-approved for food containers. There are several types of 3D printing in addition to FDM/FFF printing. These include SLA, SLS and PolyJet. Here are the pluses and minuses of FDM printing along with a comparison to the other available methods. Let's begin with the reasons to use 3D FDM printing. Fast prototypes: FDM is closely linked to rapid prototyping for form, fit and functionality of the design. Affordability: You save money with 3D prototyping. FDM delivers prototypes at not just a tiny fraction of the time but also at a much lower cost than traditional prototyping requires. The prototype can be altered and re-printed just as quickly and affordably. Complex design: FDM is ideal for producing parts with few geometry limitations, so it works well for producing complex geometry including undercuts. Marketing: This type of 3D printing is also used to affordably produce objects for marketing purposes, perhaps an item you want to pitch to a client for their advertising or to a toy manufacturer for general production. The right material for every job: The wide range of suitable materials, those listed above, is another advantage for fused deposition modeling. If you have questions about materials, we'll help you select the right material for your project. Strong bonding of parts is possible: If your design is large, it can be FFF printed in parts that can be fused together to create a finished product that is very strong and durable. There are a few disadvantages to consider for 3D printing. Half the strength of injection molded parts: Due to the extruded layering process of FDM, prototype parts are roughly 50% as strong and stiff as parts created through injection molding. Not cost-effective for large batches: If you need just a few of the same item, 3D printing can be an affordable choice because setup is minimal. However, large batches are made more cheaply by other methods. Visible steps in surfaces: The edges of each layer show in the finished product, especially in curved surfaces. However, the edges generally don't affect function. Often, the edges enhance the aesthetics of the design as in toys, trinkets and marketing products. SLA printing is short for Stereo Lithography. 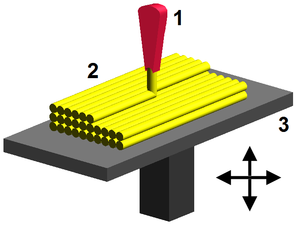 Like FDM, it is an additive or layering method of 3-dimensional printing. Instead of filaments of material, SLA uses photopolymer resins that are liquefied and then cured with focused or UV light. While FDM printers support a range of materials, SLA printers are limited to proprietary materials that might not work with other SLA printer models. FDM offers more color choices too. Where SLA printing has the advantage is in precision accuracy and resolution/smoothness that produces crisper detail. SLS printing stands for selective laser sintering. The process uses a powerful laser to fuse plastic particles together into the desired 3D design. FDM has the advantage of being less costly and faster than the SLS process when producing single parts. SLS is more efficient for large-scale parts production. In addition, no support structures need to be printed with SLS as they do in some FDM designs. The PolyJet printing process employs a carriage equipped with ports that jet liquefied polymers to print the item. As in SLA, the polymers are cured with a UV light. FDM offers the production of larger part sizes, better heat resistance and greater part strength. PolyJet has the advantage of greater detail precision, smoother surface and more rapid printing. The process begins with a using CAD software to produce your design. 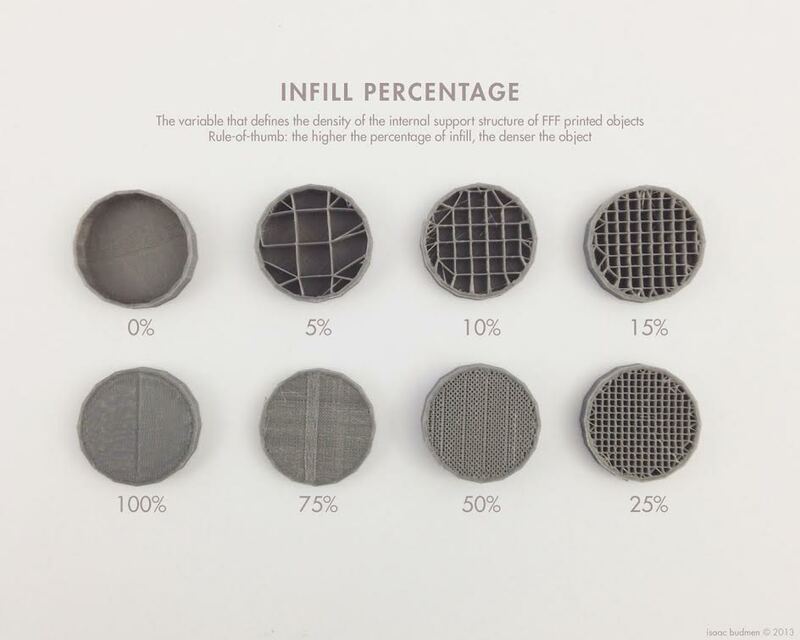 When designing, keep these tips for3D printing in mind. Make walls the proper thickness: The general rule of thumb is that vertical wall thickness should be four times the thickness of the slices being used in layering. For example, if the slice thickness is 0.010 inches, the wall should be a minimum of 0.040 inches thick. This creates far better stability and will prevent the wall from buckling and delaminating. Avoid warp: Thin-walled sections of your model might be prone to warping, so consider adding ribs in those sections to improve strength and eliminate the warp risk. Use rounded threads: When threading a part, designs with rounded roots and crests operate more smoothly than those with sharp edges. Choose a "dog point" head design of 1/32" minimum. This will make it far easier to get the threading started. Support angles: When your design features angles greater than 45 degrees, supports should be included in the design that can be easily remove once the object is printed. Space parts properly: When you're producing a batch of assembly parts, space them far enough away from each other to prevent them from fusing during the print process. The rule of thumb for assemblies being produced fully assembled is to provide a clearance on the z axis of the thickness of one slice. Additionally, the XY clearance should be the extrusion width, at minimum. Use minimum suggested text sizes: 16-point boldface type is suggested for the top and bottom of your FFF model; 10-point boldface is the minimum suggested size for vertical surfaces. Combine files for small parts into a single file: Make sure they all have the same starting height, so they will all touch the build plate. Also, leave 2mm between parts to avoid them fusing together. Limit your polycount where possible: Where it won't reduce product integrity or aesthetics, lower polycount will create smaller files. Consider post-printing options: Thermoplastics can be drilled, cut, turned and tapped after production. Making these alterations after printing might reduce the difficulty of designing the piece. Design in one of these file types: STL, OBJ, ZIP, STEP, STP, IGES, IGS, 3DS and WRL files are supported by most 3D printers. Large 3D designs are often too large for the print capacity of the 3D printer. This is a reality faced by top 3D designers in a wide range of applications from the automotive industry to at-home hobbyists. The effective solution to handling capacity issues is to design the part in pieces that can be fused or bonded together after printing. When this possibility is discussed, many designers are concerned that the strength of the part or its appearance will be diminished. The good news is that proven techniques have been perfected to bond, seal and make 3D printed parts look like a single piece. These processes are also used to join separate components of a design. Bonding parts in FFF designs is a good choice not just for large parts but when either a faster build time or less support material is required. Sectioning and bonding methods also used when one section of the part is very fragile and might be damaged during the print process if included in the job. Instead, the fragile part is printed separately and then bonded to the larger part. There are several methods used to bond FDM parts.